Ashley is an Undergraduate Advisor serving students in both the School of Interactive Games and Media and Information Sciences and Technologies. 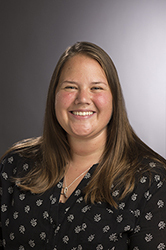 Prior to advising, Ashley was at RIT for 7 years working in the Center for Residence Life working as a Residence Coordinator and later as an Area Director where she was responsible for managing some of the Residence Halls and Apartment complexes on campus. Her time in Residence Life included supervising RAs and Graduate RAs, working with No Voice Zone, RITchie's Game Room, Alternative Spring Break and much more. Ashley earned her BA in Business Administration from Lycoming College and her Master's in Business Administration from RIT.